In an effort to defeat ISIS in Syria and Iraq, the US coalition has, to date, launched more than 27,500 air strikes. 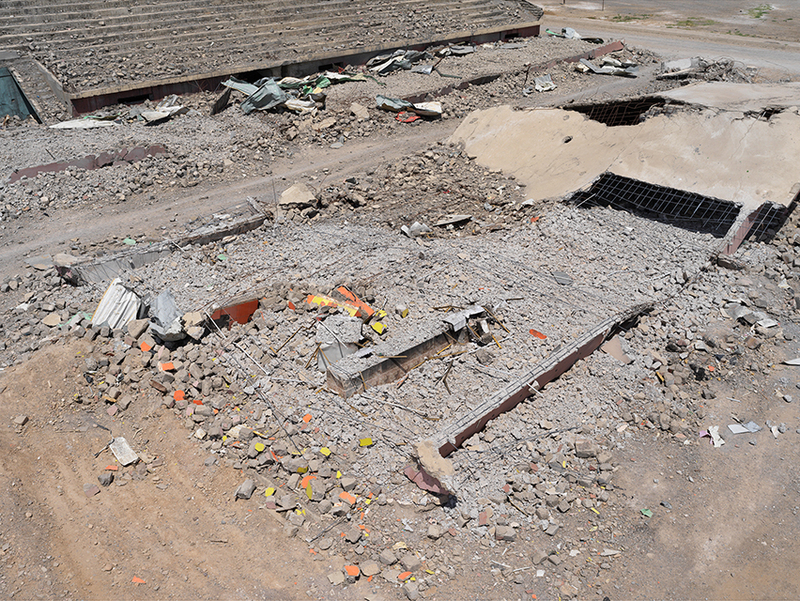 The munitions used can, if correctly targeted, hit a single vehicle or building, even a specific floor of a building, causing minimal damage to whatever surrounds it. The coalition has gone on record in the media declaring this the most accurate air campaign in history, noting that since August 2014, tens of thousands of ISIS fighters have been killed. 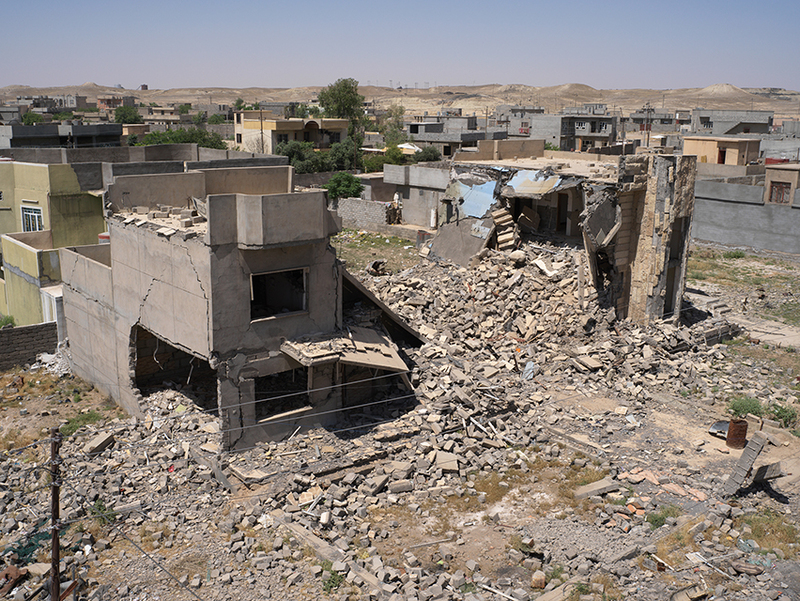 According to investigative journalists Azmat Khan and Anand Gopal reporting in The New York Times, the tallies of its monthly summaries claim that just 466 civilians in Iraq have perished. The conclusion of Airwars and other NGOs who monitor the situation, puts the civilian death toll much higher. Khan and Gopal's article also disputes the coalition figure and identifies the civilian death rate at 31 times what is officially acknowledged – that one in five strikes results in fatalities. 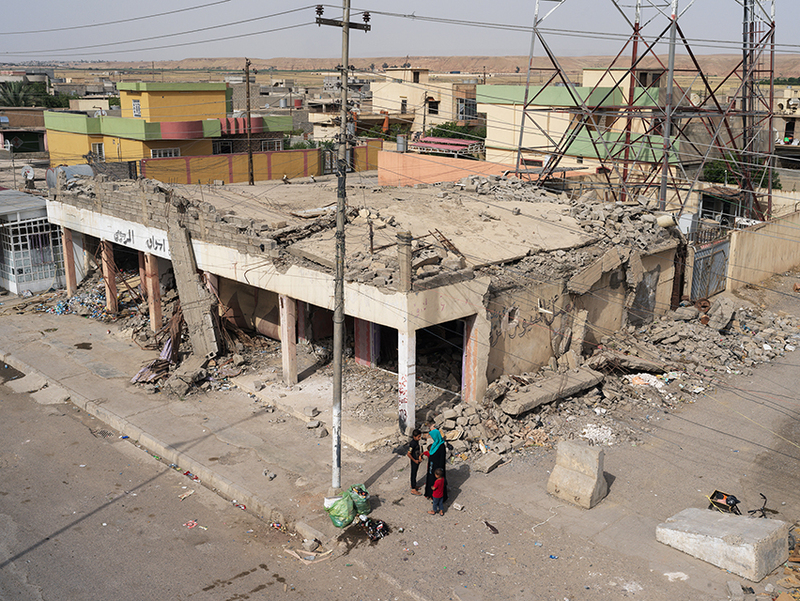 This series of images shot in Northern Iraq show the aftermath of targeted air strikes and some of those it effected. 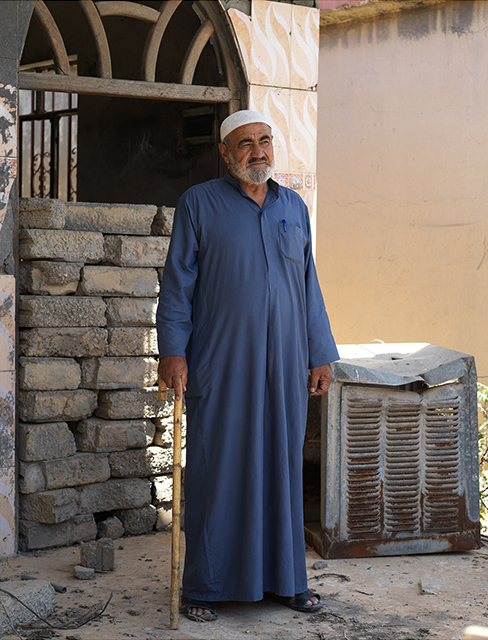 Basim Razzo’s home in Mosul was hit by an air strike on the 20th September 2015, it killed his wife and teenage daughter along with his brother and hephew who were in a house next door. Only Basim and Azza his sister in law survived. 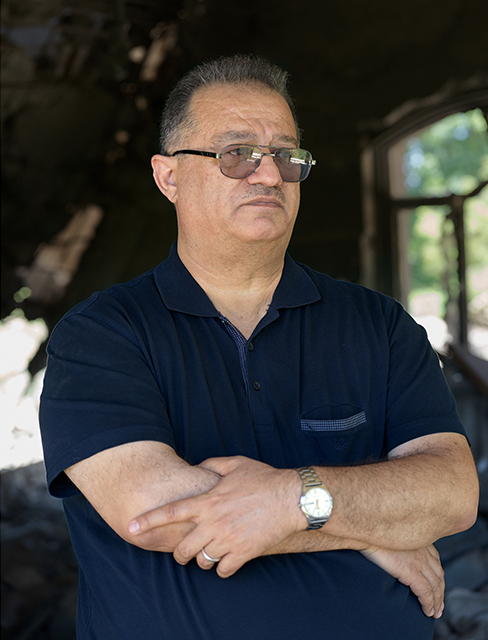 In Mosul, Iraq, Basim Razzo stands inside what’s left of his kitchen for the first time since a coalition air strike hit his home on 20 September 2015. Responsibility for the attack, which killed his wife Mayada, daughter Tuga and in a neighbouring house, his brother Mohannad and nephew Najid, was acknowledged by the coalition only after 15 months of Razzo pursuing the truth. The coalition has since expressed regret for the unintentional loss of life and offered him - the first of its kind in Iraq or Syria - a condolence payment of $15,000, which he declined. 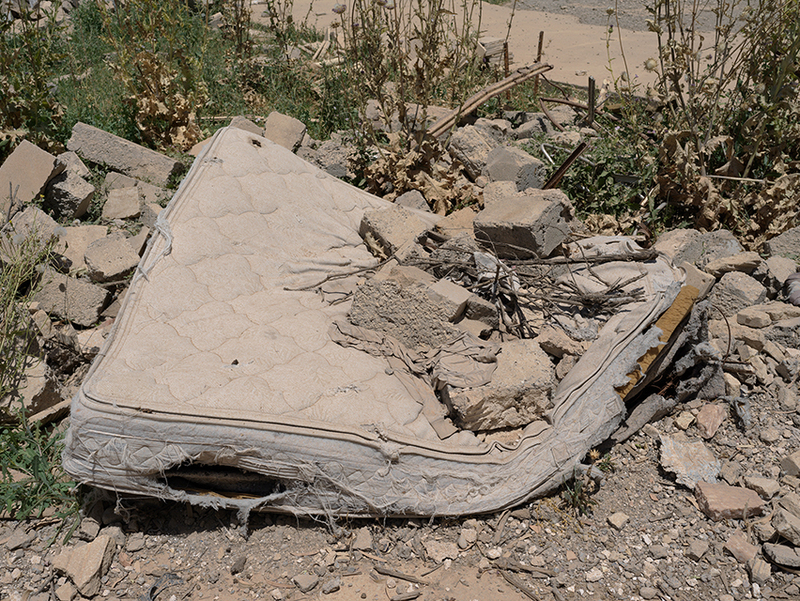 Basim Razzo’s mattress which he was asleep on with his wife when the air stike hit, only he survived. Mosul, Iraq. Two air srikes destoryed the second floor of the Asiacell Tower & Medicine shop in Qaiyara, causing civilians casualties. 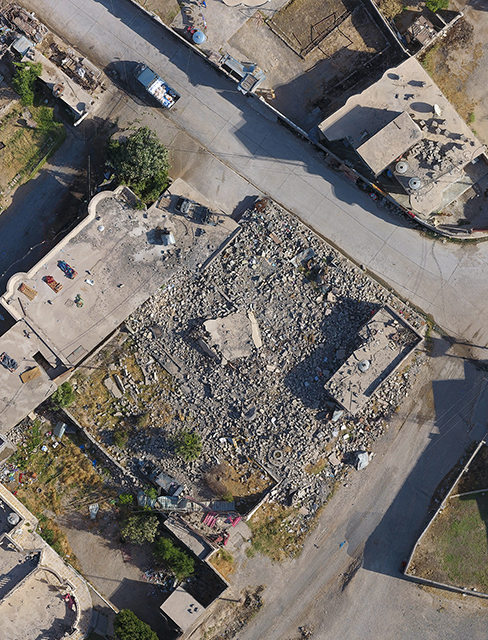 The foreground shows the rubble remains of a suspected ISIS IED factory and the civilian homes of Sameh Abdul Ghafur and Abid Abu Ali Hamid in Qaiyayra, hit by multiple air strikes resulting in deaths of civilians. 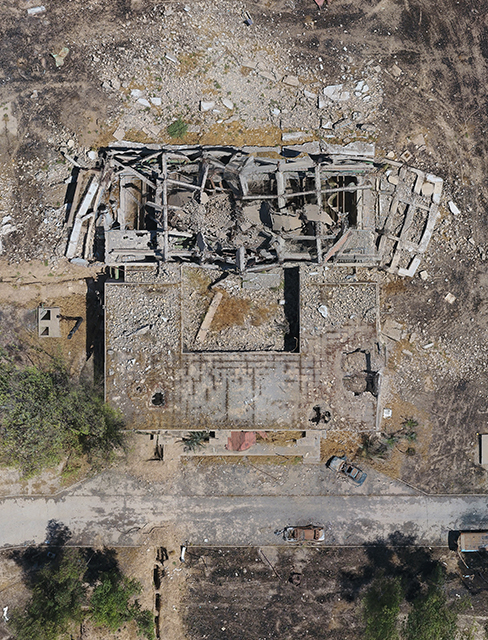 Vertical drone view of Amir Al Sharid’s home in Qaiyara, it was hit by an air strike when he was out killing his wife and children. The house of Ali Khallaf Abdullah Wardi in Qaiyara, hit by an air strike in August 2016 which resulted in the deaths of 6 civilians including 3 children. 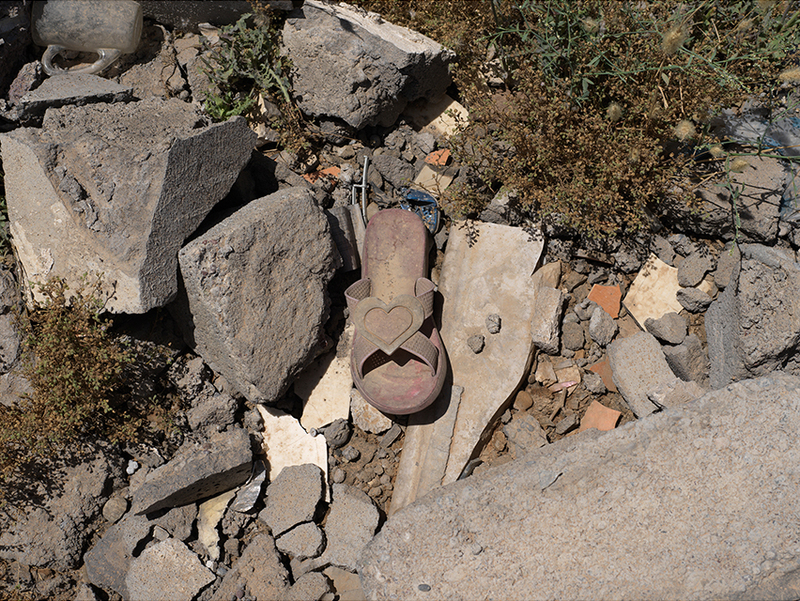 A childs sandal in the rubble of Ali Khallaf Abdullah Wardi’s home in Qaiyara. Air strikes on civilian homes located at the oil refinery in Qaiyara, Iraq. 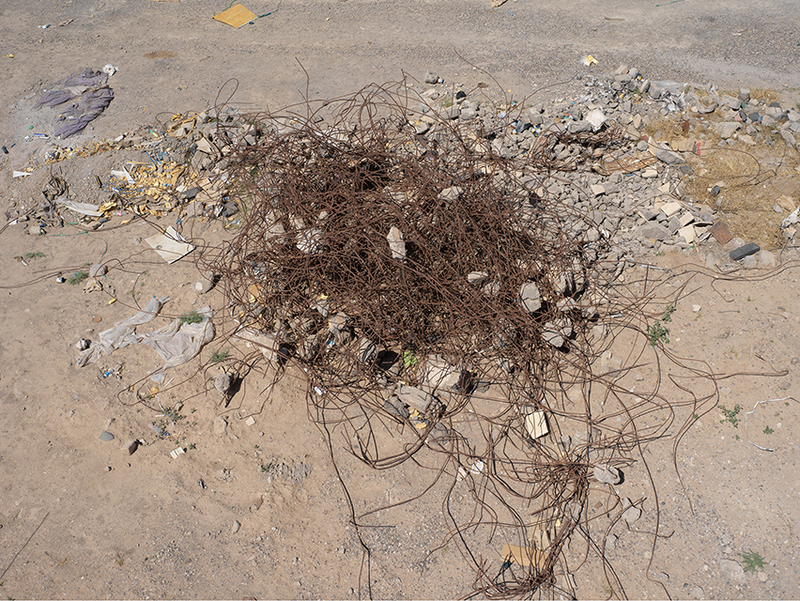 A ball reinforced steel which is all that remains of Qaiyara City Hall, which was hit by two separte air strikes that resulted in deaths of civilians. 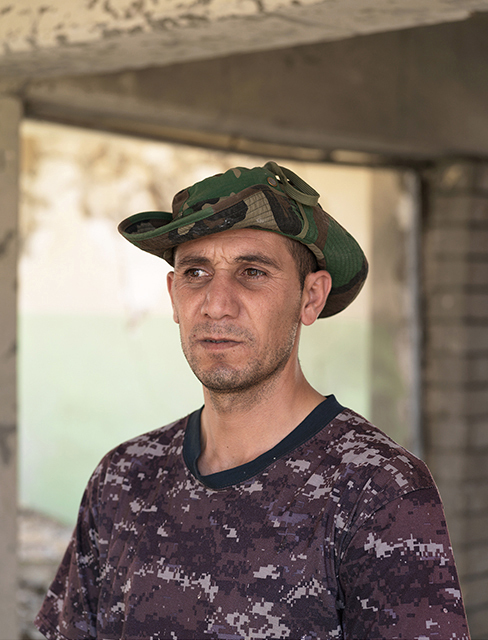 The first in October 2015 killed Abdullah Khudr Ali who was struck in the face by shrapnel as he crossed the street. The second in November 2015 a young girl Tibea Alla hit by shrapnel while playing with her brother who was also injured. 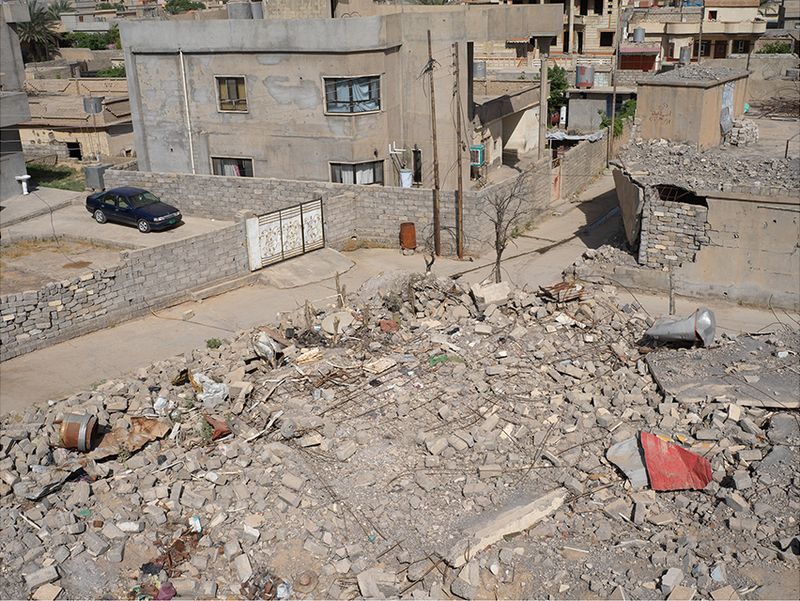 Qaiyara Stadium, hit by several air strikes, one in 2014 killed civilian Ahmed A’ageal Jasim. Abdur Rahman Areer Jarros, Imam of a local Qaiyara mosque which was not taken over by ISIS, his mosque was hit by an air strike which killed 5 including his grand daughter Hudaifa. 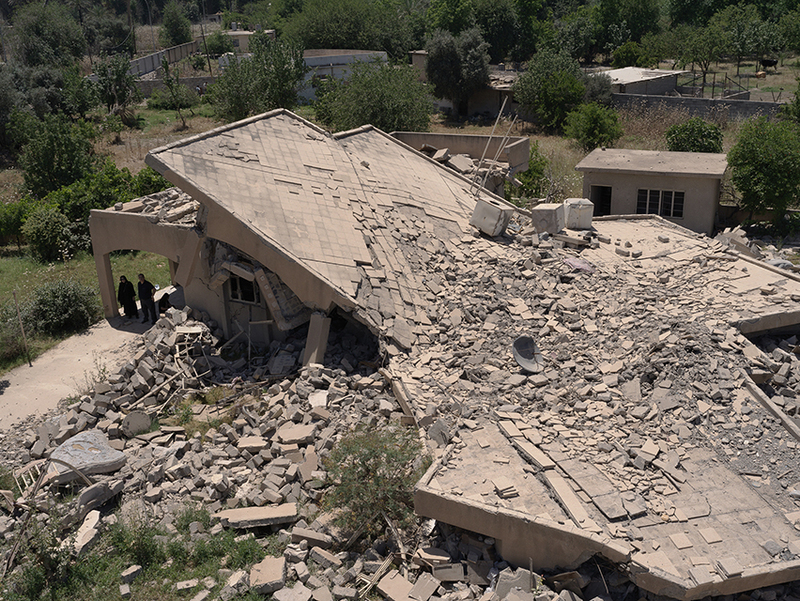 Suspected ISIS recruitment centre hit by coalition air strikes, Qaiyara. 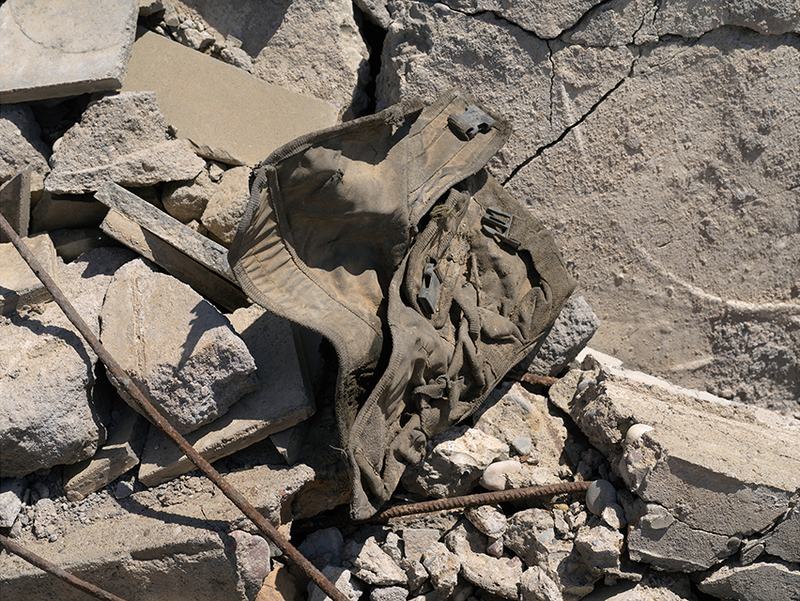 Dead ISIS military webbing pouch, Qaiyara. 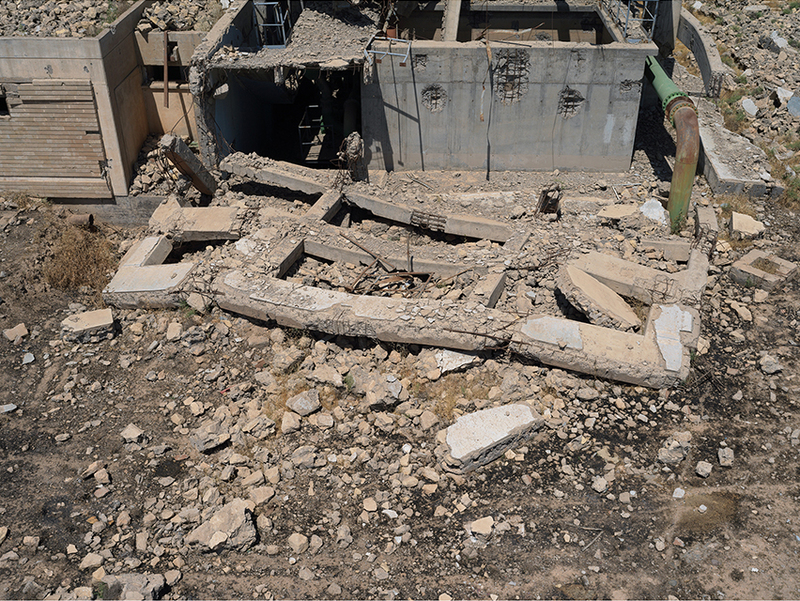 A destroyed ISIS water treatment plant hit by multiple air strikes. Qaiyara policeman (name withheld) who knew of locals who called in air strikes. 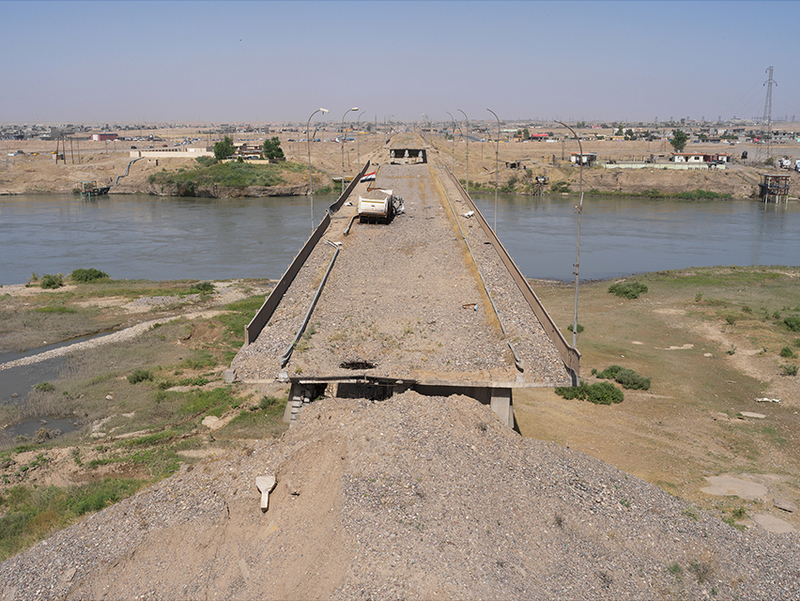 Qaiyara bridge was hit by multiple airstrikes, ISIS tried to repair the bridge by filling the holes with gravel. In an effort to defeat ISIS in Syria and Iraq, the US coalition has, to date, launched more than 27,500 air strikes. The munitions used can, if correctly targeted, hit a single vehicle or building, even a specific floor of a building, causing minimal damage to whatever surrounds it. The coalition has gone on record in the media declaring this the most accurate air campaign in history, noting that since August 2014, tens of thousands of ISIS fighters have been killed. 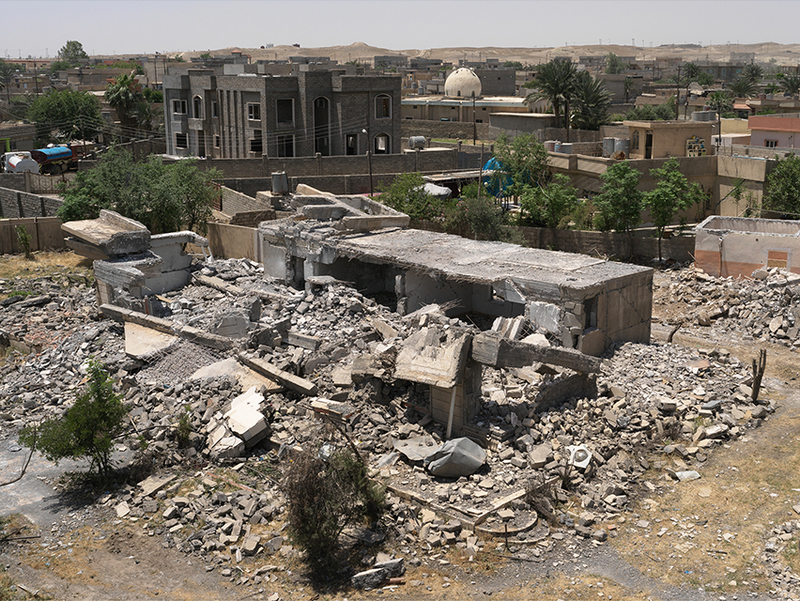 According to investigative journalists Azmat Khan and Anand Gopal reporting in The New York Times, the tallies of its monthly summaries claim that just 466 civilians in Iraq have perished. The conclusion of Airwars and other NGOs who monitor the situation, puts the civilian death toll much higher. Khan and Gopal’s article also disputes the coalition figure and identifies the civilian death rate at 31 times what is officially acknowledged – that one in five strikes results in fatalities. 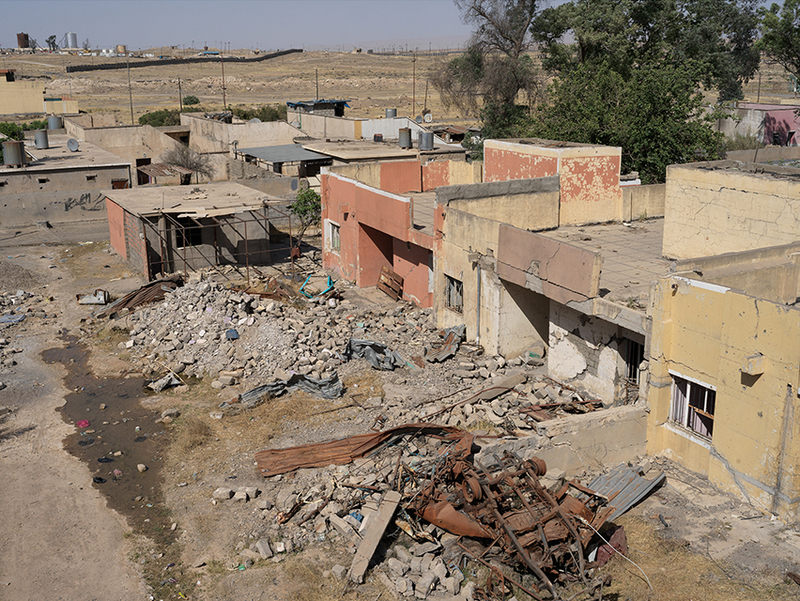 This series of images shot in Northern Iraq show the aftermath of targeted air strikes and some of those it effected.